As part of our ongoing analysis of 59 global asset classes, we've identified the asset class performance leaders for June, based on total percent return for the month. We use leading ETFs as proxies for our asset class analytics. Given the volatility this past month, which asset classes came out on top? Master Limited Partnerships (AMLP), Oil (DBO), and U.S. Microcaps (IWC) lead the pack. This was the #1 asset class in June, using AMLP as the ETF proxy for U.S. MLPs. In addition to strong June performance, AMLP is up 15.4% year-to-date, which beats the S&P 500 and the Dow Jones Industrial Average. In terms of momentum, AMLP crossed its 50-day moving average in June and is now 7.6% above its 200-day moving average. Looking at DBO, our ETF proxy for the oil asset class, we see that despite a strong June (up 2.2%) DBO is essentially flat year-to-date (down 0.1%). Looking at momentum, DBO is close to its 50-day moving average (currently 0.5% below) and its 200-day moving average (currently 0.1% below). IWC, our ETF proxy for U.S. micro cap stocks, rounds out the Top 3 asset classes for the month. IWC was up just 0.8% in June, but IWC has been the No. 1 asset class performer year-to-date among 59 global asset classes, with a return of 18% through June 2013. IWC is still well above its 200-day moving average, but it has slipped from 13.1% above the 200-day simple moving average in May to 11.5% above in June. 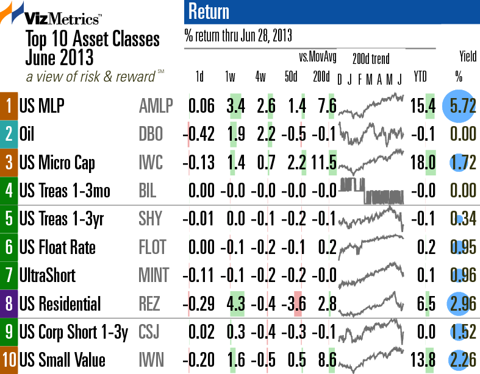 To see the full list of all 59 Global asset classes with June returns, please visit Asset Class Returns for June 2013. Here's another view of the Top 10 asset classes for June, with a some additional metrics. This is a excerpt from Asset Class Returns for June 2013.